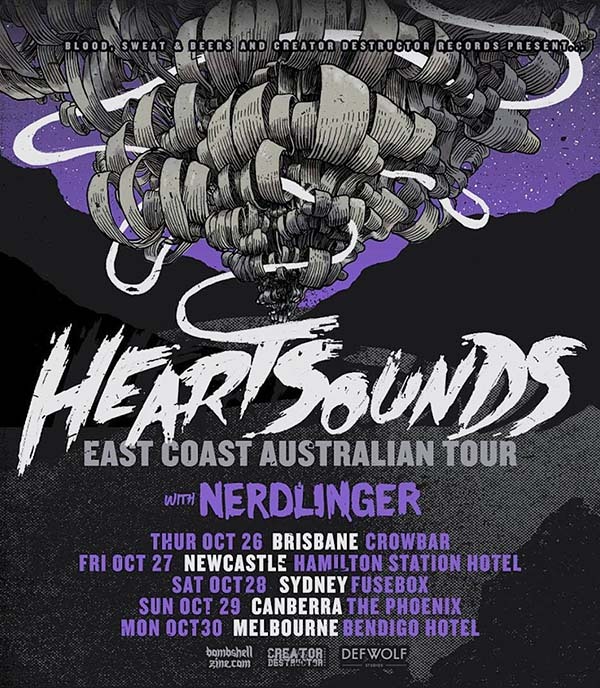 Kickarse San Fran punk rock quartet Heartsounds are headed south this spring, bringing their critically acclaimed LP Dualistic Nihilist to Australia's east coast. The album, a singular 20-minute piece of punk rock perfection is an intoxicating exploration of depression and mental health and one set to wow Aussie audiences in October. Local melodic punk menaces Nerdlinger have been confirmed to lend their talents on all five dates. Ripper! Heartsounds most recent LP Dualistic Nihilist is not your traditional full-length record. After writing three full-length records since the band’s formation in 2009, Heartsounds wanted to challenge themselves with something different - an endeavour more unique and exploratory of uncharted musical territory, combined with the lyrical recreation of a true story revolving around severe mental illness and turmoil. Sonically, Heartsounds remains true to their roots of ripping fast, melodic punk rock, categorized more specifically by dynamic vocal harmonies, heavy-metal inspired metallic riffs, and tight-knit musicianship. While honouring their past, the band succeeds with venturing into new regions of melody and expression that will surely surprise and please long-time fans of the band.